Heat oven to 425°F. Place pizza rolls on ungreased rimmed baking pan. Wrap each with one half slice of the bacon. Bake 9 to 10 minutes or until crispy and sizzling. Top with sour cream and pickled jalapeño chiles. Use kitchen scissors to snip the bacon and jalapeños for a cutting board-free snack experience. If opting to cook your own bacon, use thin-cut slices and thoroughly cook, while keeping soft enough to wrap the pizza snacks. 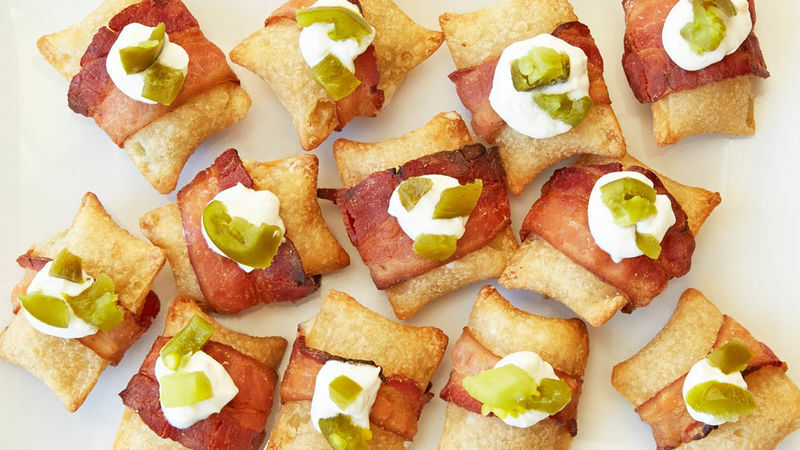 Crispy bacon will be more difficult to wrap around the pizza snacks.